932 pages | 436 Color Illus. Vascular surgery has seen a remarkable evolution. A discipline focused on the natural history and treatment of vascular disease by open operation is now primarily a minimally invasive specialty. Mastery of the basic pathophysiology has been retained while the transformation by improved imaging and endovascular intervention has been integrated into practice. 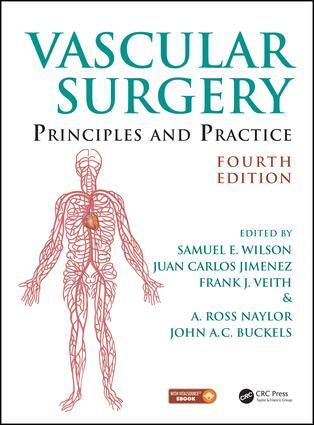 This fourth edition of Vascular Surgery: Principles and Practice has incorporated these advances building on the specialty’s past assets. Knowledge of natural history and open surgery will always have an essential role in optimal care of patients with vascular diseases. The authors’ exposition of the old and the new will make this edition a valuable resource for vascular surgeons and all others dedicated to the care of vascular patients. "In the final analysis, this book reflects the changes to vascular surgery all have witnessed in the last 50+ years,adhering to tried and true principles while adopting evidence-based medicine. It is an excellent reference for vascular surgeons in training and a worthy review book for established practitioners wishing to refresh their knowledge in areas on the periphery of their expertise." Exposition of interventional methods. Vascular anatomy, techniques and complications associated with transplantation surgery. Extracranial vascular disease. Carotid artery stenting. Management of asymptomatic carotid artery disease.